and the other firmly planted on a pew. Backdrop: Set in the Ozarks in the 1950s, Geese to a Poor Market is a geographic slice of Americana with an ensemble cast of crooks, moonshiners, preachers, lawyers, and odd-ball characters. ﻿﻿The Story: In 1954 Rita Sanders leaves a cheating husband and returns to her childhood home in the Missouri Ozarks. She lands a job at a honky-tonk on the outskirts of a dry bible-belt village owned by a retired Navy petty officer. Her religious mother tells her she is driving her geese to a poor market--an Ozark saying that means she has made a poor choice. With the return of her estranged husband, the prodigal daughter discovers there is more than one snake in the garden. L.D. Whitaker works as a lawyer for a federal agency and lives in Jefferson County. But he grew up in the Ozarks in south-central Missouri — the setting for his first novel, "Geese to a Poor Market." About that title: Selling geese to a poor market is an Ozarks metaphor for selling yourself or your goods for less than the value. And in fact, lots of dubious dealings turn up in this entertaining tale. The book opens in 1955 as Rita Sanders heads toward her girlhood home in the Ozarks, her 7-year-old son beside her as they drive away from a philandering husband in Iowa. Much of the plot — such as it is — concerns the struggle by her estranged husband and his ally, Rita's mother, to take custody of the boy away from Rita. You see, she has taken to living in unmarried sin with Sam Rockford, who owns the honky-tonk where she works as a waitress. The tavern owner is a Navy career vet and a good man, although his honky-tonk leaves a lot to be desired. Whitaker calls it "a southern Missouri beer joint on U.S. Highway 60, just outside the city limits of Birch View, a roll-up-the-streets-after-sundown village of 432 residents, according to the road sign … During the week, Club 60 was an oasis for bib overall working men from the logwoods and sawmills, but on Friday and Saturday nights, it was a honky-tonk where people danced to the jukebox or, occasionally, a live country western band." The book's revival of a nearby place at a long-ago time (a time when you could fill your gas tank for $2.50) gives it a special charm. So do Whitaker's characters — some of them rural hicks, some of them county sages and even a surprisingly sophisticated down-home lawyer, J. Bob Dalton, a regular at Club 60. Although this book is Whitaker's first novel, he has produced lots of Ozarks-based short stories and essays. If we're lucky, he'll give us another novel. "Memories of Ozark history stir up some familiar chuckles and tender emotions, as is the case with L.D. Whitaker's novel. Set in the 1950s, the story opens with young mother Rita Sanders on the road to Tremont, her childhood home in the Ozarks, after her truck-driver husband leaves her. When she takes a job in a local honky-tonk, Rita ends up with a little more than she bargained for, including the disapproval of her devout mother and the attention of a ruggedly handsome new boss. 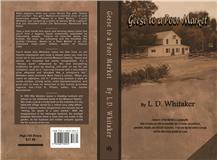 Whitaker, who lives in High Ridge, weaves a story of back-home folks and country livestyles. He combines action with characters to portray a rural family facing hardships and heartache in the Missouri Ozarks. Readers will feel the spark of hope that can only come from good friends, the love of a family, and new beginnings. Lonnie Whitaker acknowledges Missouri Life in the book, as the first to buy a story from him, thus helping him to think of himself as a writer. Missouri Life published both "When TV Came to Montier," (April 2001) and "Memories of Country School Days," (August 2001). Author's note: I'm still grateful a quality magazine such as Missouri Life provided a springboard opportunity for me. L. D. Whitaker’s debut novel, “Geese to a Poor Market,” is an entertaining read, as he takes us back to the Missouri Ozarks during the 1950s. There’s love, revenge, gambling, honky-tonks, revivals, adultery, gun fights and more with a cast of characters that are lively and fun. Whitaker provides a page-turning plot all the way to the end. Anyone familiar with the Missouri Ozarks or the 1950s will appreciate this novel and hope Whitaker is working on his next. It starts with Rita, a mother fleeing, with her young son, Wesley, from her cheating husband. She’s going back to her roots, back to Tremont, Missouri, to start a new life for Wesley and her. She plans to live with her parents, which can be a blessing and a curse when her mother, Beluah, is Bible-toting and judgmental. Rita wants to get a job and goes to the first place where she’s offered one—at Club 60, a bar with an attractive owner, Sam. She and Sam soon start a relationship, and Beluah neither approves of Sam or the job for her daughter. Besides the story of Sam, Rita, Wesley, and Beluah, as well as Rita’s husband who wants custody of Wesley, readers are also introduced to other colorful Ozark characters, which make this novel fun. Although sometimes there seems like a lot of characters thrown into the mix, Whitaker does a good job handling them and tying up the many subplots at the end of the novel. There’s Big John, who owns a “rival” bar and likes to set up gambling opportunities for big city visitors from St. Louis. These gambling opportunities always have an ulterior motive, from loaded dice to fixed poker matches. J. Bob is one of the attorneys in town who likes his liquor, but he knows a bit about the law, too. Then there’s the Collier brothers, Ethan and Elvin, who are criminals, and get another thing coming to them when they mess with Sam and Big John. The novel gets it’s interesting title, “Geese to a Poor Market,” from a common Ozarks expression, which Beluah says to Rita when she discovers her daughter is looking for a job as a bar waitress. The expression means selling yourself or your products for less than their worth. In Beluah’s opinion, this is what Rita is doing, as she tries to put her life back together as a single parent and becomes employed at Club 60. Although Whitaker is a devout Missouri Tigers fan, readers in East Central Illinois shouldn’t hold that against him and his first novel. He currently lives in Jefferson County, Missouri, but he grew up in the Ozarks, attending a two-room school house. He attended Missouri University Law School and works his day job as a district counsel for a federal agency. “Geese to a Poor Market” won the best book of the year (2011) from the Ozarks Writers League and was placed in the Missouri History Museum Library. So, grab a glass of lemonade this summer, and re-visit the 1950s with Whitaker’s debut novel. Not a bad way to spend a summer day! Margo Dill has a degree in English from Truman State University and often reviews books as a columnist for “WOW! Women On Writing” e-zine and her blog, “Margo Dill’s Read These Books and Use Them.” (http://margodill.com/blog/) She recently moved from Mahomet and now lives in St. Louis with her family. The Ozark Writers’ League selected Lonnie Whitaker’s novel, Geese to a Poor Market, as the 2011 Best Book of the Year on November 18, 2011. This prize is awarded annually for a book published the previous year. Whitaker is a 1965 graduate of Willow Springs High School where he competed on Bear athletic teams. Prior to moving to Willow for the 7th grade, he and his brother Jack Whitaker, CEO of Willow Care, lived on a rocky, forty-acre farm and attended a two-room school in Shannon County. Whitaker earned undergraduate and law degrees from the University of Missouri, but credits a venerable WSHS English teacher, the late Mrs. Jesse Munford, with providing a solid foundation in writing and for instilling in him the importance of rewriting. While the novel is a work of fiction, he sometimes “borrows” an actual name for a character. He named a sheriff “Speedo” after the legendary Willow Springs football coach. In addition to this novel, his writing has appeared in Missouri Life, The Ozark Mountaineer and several anthologies and literary journals. In 2005 he was awarded the John Woods Fellowship for the Writers Colony at Dairy Hollow. In 2007 he was an associate editor for the anthology, Peculiar Pilgrims: Stories From the Left Hand of God. He is a full member of the Missouri Writers’ Guild. The book, published by High Hill Press, is available online at Amazon.com or from the author through his website, www.geesetoapoormarket.com. Branson, MO: November 19, 2011: The Ozark Writers League selected Geese to a Poor Market as the 2011 Best Book of the Year. This prize is awarded annually for a book published in the previous year. What happens when you cross Norma Rae with Thelma and Louis? You get a Waltons-on-steroids slice of rural American called Geese to a Poor Market . . . Whitaker has cooked up a batch of literay white lightnin' that you shouldn't miss! Take a look inside this warm and winning debut novel and you filnd a bygone Ozark community populated by interesting people. They're all here--the pios, the foolish, the wise, the scheming and the troubled, the quietly virtuous. Geese to a Poor Market is an old-fashioned treat. You'll know why Whitaker takes his title from an old Ozarks express and what it means when you read his novel set in the south-central Missouri Ozarks . . . . It's a "literary work" influenced the oral storytelling traditions he grew up hearing, and with an eye for apt metaphor, such as "row-crop Farmall with a two-bottom plow attached and elevated like a scorpion's tail." Whitakaer takes seriously Mark Twain's advice, When you catch an adjective, kill it," preferring instead a stryle of svelt similes, strong verbs, solid characterizations, and good plot to keep us immersed in this sollidly grounded regional tale. .. . Whitaker's first novel gets off to a fast start and never lets up. * * * But as might be expected of an attorney-author, the plot is enriched by a lawyer with an eye for loopholes. J. Bob Dalton, the town's only lawyer and "house counsel" for the local honky-tonk, provides historical insight in dealing with the "innocent and injured" complications of divorce law prior to the advent of "no fault" dissolutions. He tells a client, "Hell, Sam, most of the divorces I handle are based on collusion because the parties lie to get the divorce." Reviewer's Note--Geese to a Poor Market is a character-driven novel by a natural story teller, reminiscent of John Grisham's A Painted House and Fanny Flagg's Standing in the Rainbow. 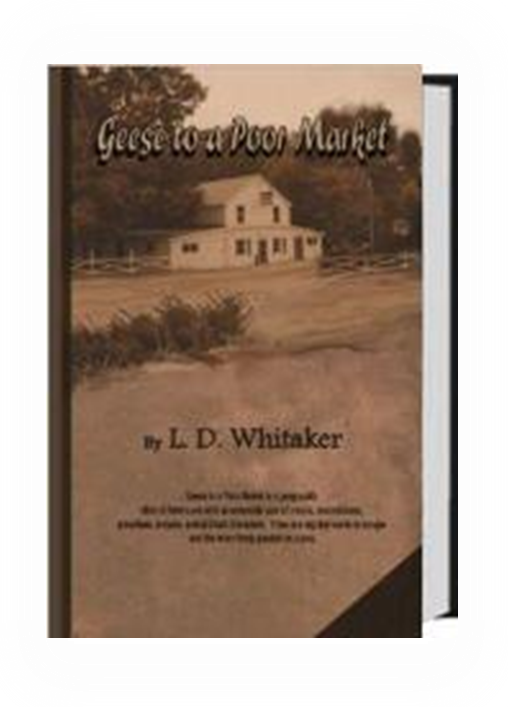 Recently I finished reading Geese to a Poor Market, written by L. D. Whitaker and published by High Hill Press. The book's setting is in the Missouri Ozarks in the 1950s. Its title comes from an Ozarks expression that means selling yourself or your goods for less than they are worth. Whitaker's novel is rich with the sights, sounds, sayings, and characters of the Missouri Ozarks. Told from multiple points of view, the story centers on the lives of Rita Sanders and her son Wesley. At the beginning of the story, Rita leaves her semi-truck-driving-hard-drinking-cheating husband Ray and takes their seven-year-old son Wesley back to her parents' home in rural Missouri. Life isn't easy for Rita or Wesley, but Rita's parents tighten their belts and do their best to welcome them home. Rita's father Will O'Dell is strong and proud, but also has a gentle streak, especially when it comes to his grandson. Although Will's left arm has been amputated above the wrist, he manages to make a living by farming. Rita's mother Beulah is prudish and judgmental. She disapproves of Rita's leaving her husband, even though he was the one who was cheating, but she loves her grandson and wants what she thinks is best for him. Beulah is insensed when Rita gets a job working for retired Navy vet Sam Rockford at a local honky-tonk to help pay for their share of the family expenses. Beulah tells Rita her actions are like, "driving geese to a poor market." Things get dicey after Rita moves in with Sam, and Ray shows up to reclaim his son. In the tradition of Ozark storytellers, Whitaker knows how to spin a good yarn. His book is peopled with characters who leap off the pages, including moonshiners, lame-brained criminals, fire-and-brimstone revival preachers, the goodly, and the goodless. Whitaker's background as an attorney shows in the parts of the book that deal with the intracacies and nuances of Missouri law. His descriptions of life in the Missouri Ozarks are vivid and specific. It's hard to find fault with Whitaker's debut novel. My only criticism--and it's a minor one--is that at times the detailed descriptions and lengthy dialogue interrupt the flow of the story. On balance, Geese to a Poor Market is a thoughtful and an entertaining tale that captures the essence of the struggles, loves, and lives of a family living in the Ozarks in the mid-1950s. Lonnie Whitaker blends whimsy and mayhem in this engaging tale of life in the 1950s Missouri Ozarks. Copyright 2010 Geese to a Poor Market. All rights reserved.